I have always struggled with the title “Good Friday.” As I look with human eyes on the twisted tragedy of that day, nothing seems good. Greed, slander, jealousy, and compromise brought death to the Giver of Life. But on that Friday two beams intersected: the arm of love reaching down connecting heaven and earth while the other, the arm of grace, embraced all humanity. That is very good! Although my “blindness” wasn’t physical, it was debilitating! Church going wasn’t a regular feature of my childhood. I did attend enough for me to get the gist of a baby born in a manger and a man on the cross. However, I had no idea how that connected to my life. It wasn’t until I was 12 years old that I was told the full message of the cross. God is merciful and gracious. paid the price for my sin. God accepts His blood as payment for my sin. I still cannot get my head around the profound simplicity of this truth. But at that moment, my heart embraced fully the reality of such a gift of love. It would take over a decade to surface from the whirlpool of death thoughts and actions. As a young mom, failing in every capacity of life, I left my home and little family with one intention – to end the onslaught of internal pain. Though I had been unfaithful, He remained faithful! Though I had tried to run from Him, His love sought me out! There in the middle of snow bank, I laid down every broken piece of a life twisted and torn. I had nothing good to offer Him – nothing of value to give. And He did! The Saviour of all wanted relationship with me! Tears still flow freely down aged cheeks as I come face to face with the awesomeness of such love. Who can explain it? Who can comprehend it? Can it be defined or measured? Yet, one thing is for sure; it cannot be denied. Through the decades it continues to be my soul desire… to love each day a little more as He loves… with one arm reaching down to the broken pointing them up to Jesus… with the other reaching out to gather “whosoever will” on this journey of faith. 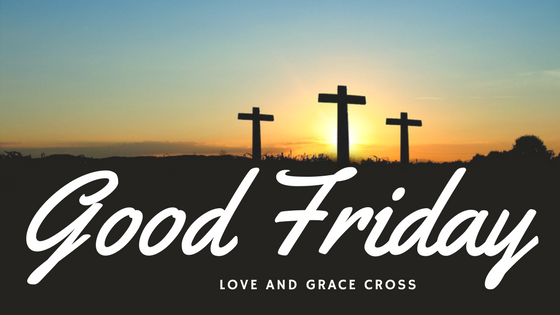 It is all because of Good Friday when two beams intersected: the arm of love reaching down connecting heaven and earth while the other, the arm of grace, reaching me. Even me! That is very good! the Just of the unjust. ← Give Me Chocolate and Nobody Gets Hurt! Worthy for the unworthy…as you wrote. That is Good Friday for me -not only for that one day but for all. That He loves me at all continues to be amazing and humbling. My prayer also is to be able to love as Jesus does. A love that caused fishermen, tax collectors, prostitutes, the sick and even the wealthy KNOW that He loved them and accepted them as they were. Yet He did not leave them there but grew them to be all He had set in His heart for them to be. Can I love like that?